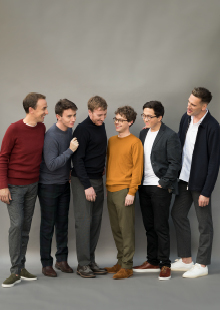 The King’s Singers are back! Fresh off their 50th anniversary tour, this “immaculate” (Boston Globe) vocal sextet returns to Santa Fe for another magical evening at the Cathedral Basilica of St. Francis of Assisi. Known worldwide for their “seamless blend and pitch-perfect, liquid tone” (Washington Post), these Emmy- and Grammy-winners span genre, emotion, and time in their spellbinding performances. Whether exploring Renaissance classics, performing new commissions, or grooving to delectable crossover arrangements, this flagship British ensemble has something for everyone.